This is one of four pieces I plan to complete in January (they're all basted now) -- the four that I've mentioned innumerable times. This little series is local art, the featured digital images taken right here in Fortuna. 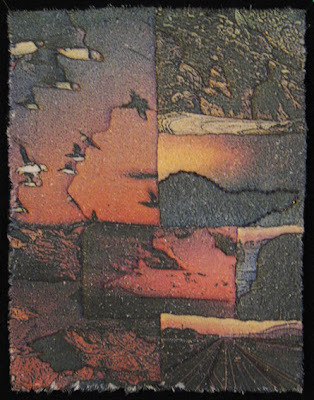 The sky images themselves could be the start of another series of small works. 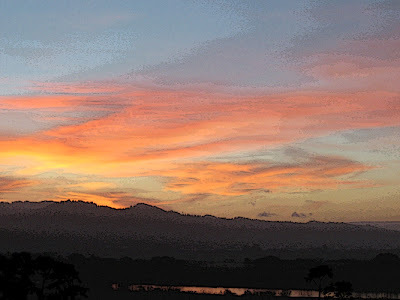 To see my daily sky images, check out Sky Journal. creative doors closed making way for new adventures to come (no more spinning, weaving, jewelrymaking -- although some supplies are still available here). 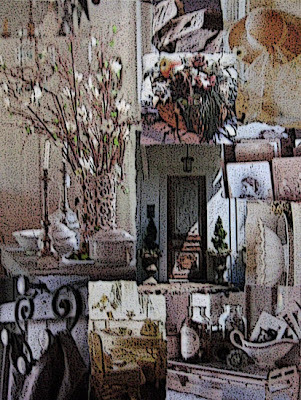 As I move into 2011 my creative "vision" still seems a little murky when I try to articulate it verbally. So I'm going to quit trying to name it, because words just get in the way. It's evolving in its own right, on its own terms, in its own way, if I just don't try to categorize it. I'll let it be what it wants to become and go along for the ride. ...the sweetness of doing nothing. Yep, I've done close to nothing over the last four days. I'm still working on the not-feeling-guilty part. 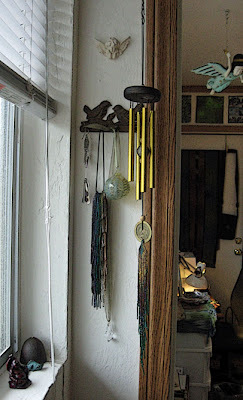 Although I did add to the list of things I'll do to have a Brilliant 2011 (brilliance being my word for next year), tinkering more in my studio without a plan. Not all the time, but more than I typically do. I have made good inroads into the Monk series, though, am nearly done with season 3...totally loving it. I've gotten back into collage in two very small journals I began earlier this year -- haven't done anything there for three months at least. I have those four quilts I keep referring to ready to baste into sandwiches; they'll get done in January. Made a delicious pot of chicken noodle soup with the leftovers of a Costco cooked chicken I had for supper on Christmas. Baked my best apple pie to date and have been enjoying it daily. Have been sleeping late (for me). And that's about it. So onward, to the new year. The last three days were pure delights for me ~ I never even left the studio/home except to walk across the street to the mailbox. I really needed the solid creative time...and that paved the way for my next two weekends, both 5 days each because of the holidays. 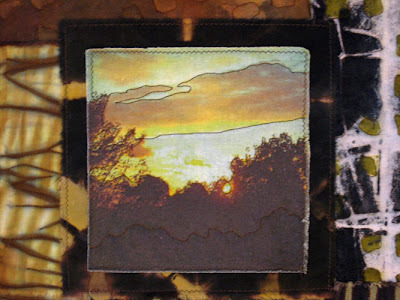 This piece is the eighth In Dreams mini quilt, on raw silk. 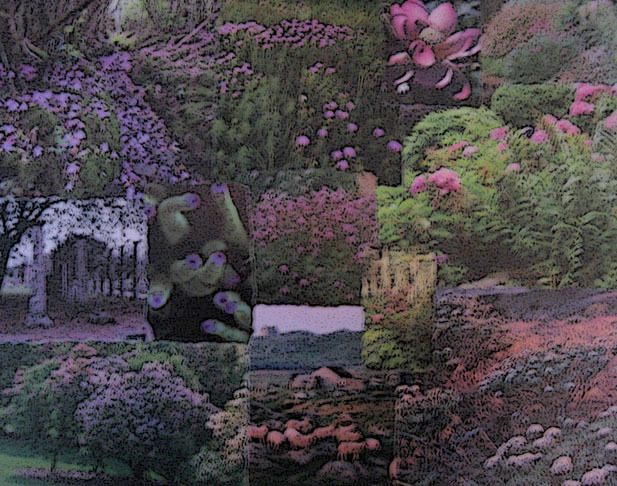 I collaged much more than usual these past days -- I'd fallen a bit behind -- but I caught up with 2 or 3 pieces a day. I completed the Fiberactions "environment" quilt and am working on the frame as we speak. 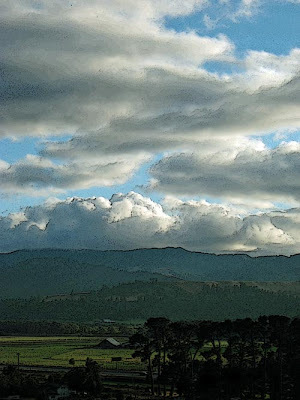 I also spent a lot of time feeling absolutely sublime ~ listening to the rain, feeling the cool breeze, hanging out with BeeGee, and reading another of many books on Italy -- this one, The Hills of Tuscany by Ferenc Mate. I love reading about others' adventures recreating their lives from elsewhere, in Italy. Hope you have a wonderful week leading up to Christmas, and a blessed holiday season. Twenty years ago I was experimenting with abstract work on paper. I had had a few pieces framed and displayed them in my home or office. A few years ago I got rid of the frames, which I no longer liked, and imagined doing something else with the paintings eventually. 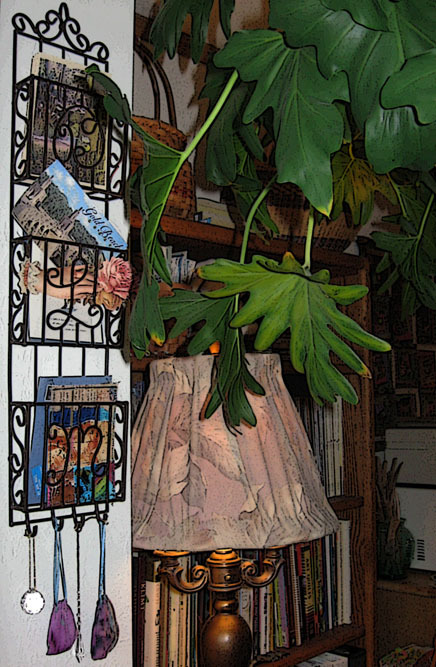 Concurrently, for years I've lamented my collection of ugly but extremely functional industrial/office bookends, those beige metal things we've all seen or worked with. This morning, these two streams of thought came together. And now I no longer have bookends I hate looking at. 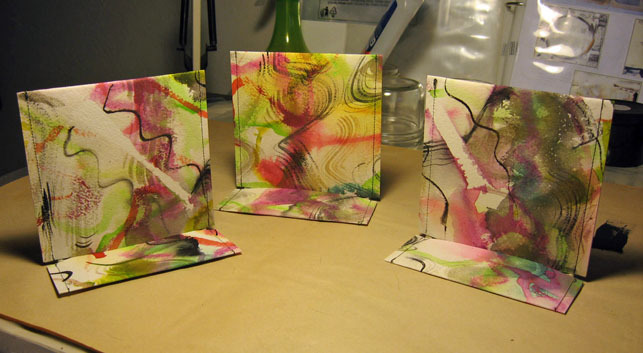 You could do this with any mixed media work on heavy paper, and if I had yet more bookends to cover, I might do just that. But I'm probably set with these, for the rest of my life, or until I ever decide to change them. An unanticipated delight from cutting up those old paintings ~ I like the work a lot better now, in bite sized pieces! I've been working all week, in bits of time here and there, on my Fiberactions "environment" quilt...but I won't be posting it until reveal day on January 15. I'm really happy with the way it's turning out. The fabrics have been on my design wall for at least a year, hoping to be a quilt with a similar theme but larger, that never quite came together. 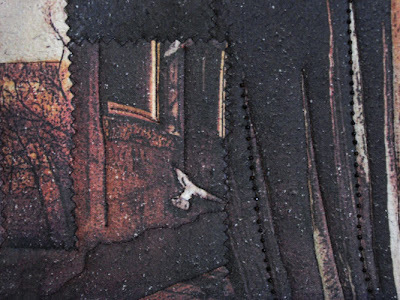 This piece, then, is obviously the fabric's intended use. Even though I said earlier that I didn't intend to have a list of plans and goals for artmaking in 2011, I have been making a list of things I hope to get back to at some point. Funny, next year's list looks a lot like this year's list did a year ago! That means a lot of techniques to revisit. I always anticipate spending more time on a technique or at least getting back to it again sooner, but life inevitably gets in the way. And the years roll by. 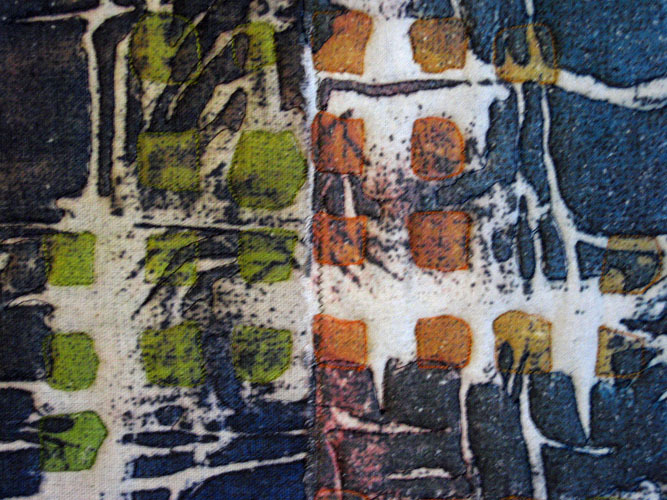 I haven't quite solved the dilemma of where to leave printed fabrics to batch overnight, now that I'm living in my studio. Once I have that figured out perhaps I'll jump back in. One idea might be to do a smaller number of pieces at one time, but do several sessions of that technique over a week or so. This is promising to be a rainy weekend and I'm looking forward to it. I'm hoping for a wave of creative energy to motivate me to action on a bunch of work in process plus several things I want to try. Once I get into that flow, the activity feeds on itself. It's the effort of getting my feet wet again that periodically holds me back. I can't really blame it on the time of year, because the holiday season makes very few demands on me or my time. Rather, I think I'm still working my way back from three months of nearly constant change in just about every area of my life, reacquainting myself with my creativity and my muses. I like to be productive, it's satisfying, it feels good. I have to remember this particularly at times when I lament the fact that I make far more work than I sell and I'm not sure what to do with all of it. The acknowledgment of that can be enervating...you know, why make more stuff? The thing is, I'm a maker. 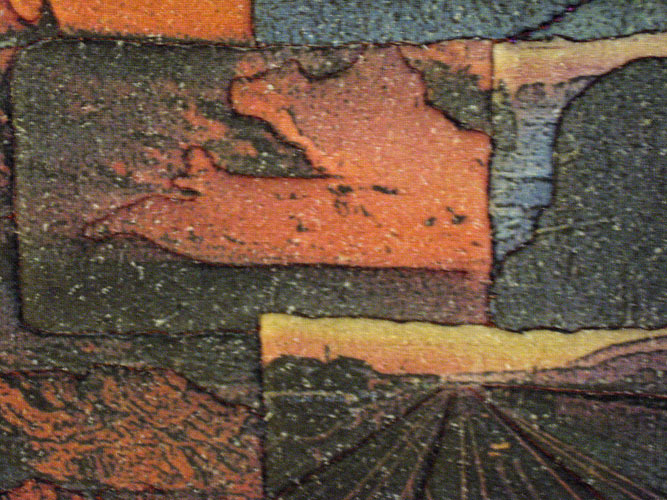 In truth, I have to make art for the joy of making art, of working with materials, of trying new techniques, of challenging myself to articulate my responses to the world with my chosen media. 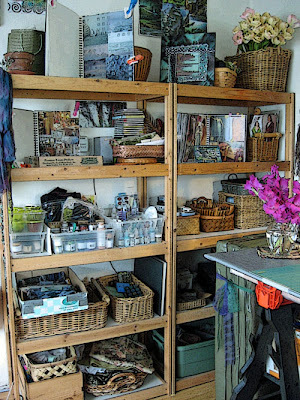 And when I worry about having too much finished art tucked away in the nooks and crannies, I'll remember my dear friend Joan, who has a huge studio with stacks of work on every flat surface and something hanging or pinned up to every square foot of wall space -- how absolutely engaging and inviting it is, how I could lose myself for weeks exploring everything there is to see there. I should have so much finished or in process art! I got going on a couple of back-burner projects this week. The first -- not as back-burner as gotta-pull-something-out-of-the-bag -- is Fiberactions' "environment" themed quilt, due January 15. For weeks nothing has grabbed my imagination with this word, but finally something clicked. So because I want to use for that piece some of my handmade fabrics that have been earmarked for two other quilts, I've moved forward on the two other quilts to I know what fabric I have left for "environment." Whatever gets you moving! 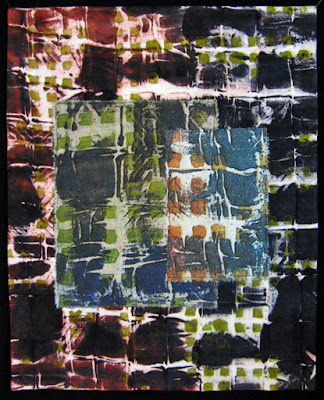 The two quilts just mentioned are part of a 4-quilt series that I've talked about a couple times over the last few months. I decided I want to have them ready for my show at Curley's Grill in Fortuna, April & May 2011. Two of the four came together months ago -- I just need to take all the steps necessary to get the fabric to be a quilt...but the designs are good to go. The other two, the ones I'm working on this weekend, have taken a lot more effort to meet my own requirements. Just finished off on the design on one this morning -- will get to the other one later today. I'm quite keen on listening to myself, my own critique, my own judgment when I'm designing. I recognize those moments when I want to go with what I've got just to get it done, enough so to put something on the shelf for a few days, keep looking at it and trying different fabrics and/or arrangements, and then coming back a while later to redesign the whole thing before I get what I really like. It's a process I'm developing more trust in as I age. If you're a knitter or crocheter, or interested in handspun yarn to weave with, check out the yarns I've listed at my Etsy Shop this week. A couple of enormous cartons of handspun yarn have boiled down to only these remaining skeins now available at Etsy. Thanks for reading, and have a wonderful weekend. Finally something new to post -- just finished today, Cloud of Unknowing, 26x17 inches. 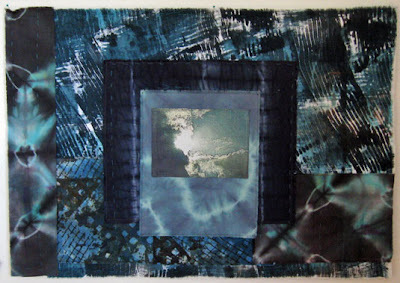 This piece belongs in the Beyond Boundaries periodic series. As I have with many quilts recently, I put two layers of batting in this one. I've been using thin-ish cotton or thin cotton/poly batting when I double up. 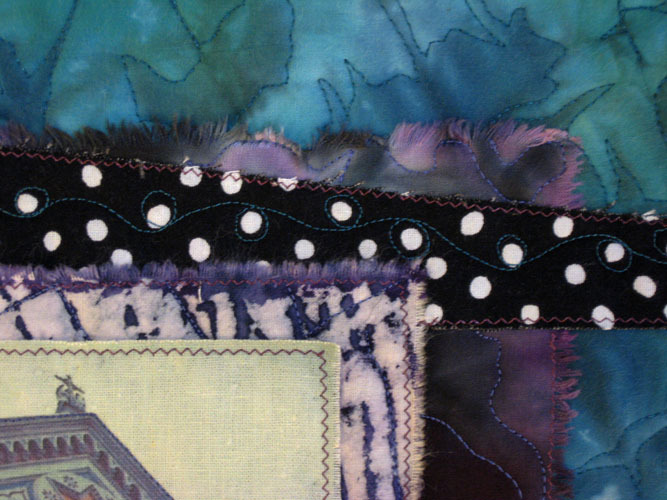 I love the deep relief that the quilting lines create, plus the heft of the finished quilt. I've found that heavier or doubled batting makes a piece hang a lot better and flatter than a single layer of batting does. The center image was one of my many digital experiments. In this case I printed the image on a transparency, then burnished it onto fabric treated with acrylic medium. The colors transfer in an unusual way with this method -- I wasn't able to get the full spectrum of colors -- but I like the moody, uncertain quality of the image. I had an excellent liquidation sale over the weekend, was able to sell a lot of no longer needed materials plus a few finished pieces. Then I posted a lot of the leftover supplies on Etsy and sold much of that in short order. There are still some spinning and weaving supplies left, though, if you want to have a look. Usually, at this time of year, I begin an exhaustive list of what I hope to do in the following year. 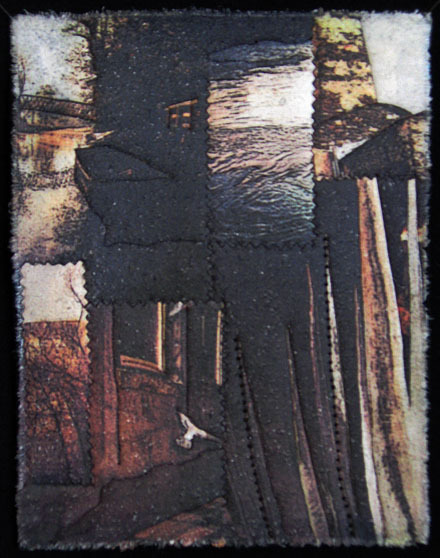 Last year at this time I was involved with SAQA's Visioning Project, my goal being to "find my voice" with art quilting. 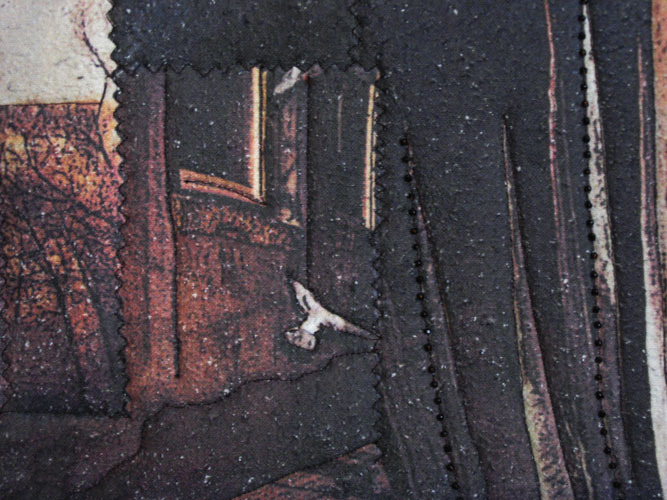 A few months into the project I withdrew myself from the structured aspects of it, but I did continue to move forward with what I intended to pursue -- which was/is my fascination with digital imagery on fabric. So in retrospect, I accomplished a lot this year despite giving up on the busywork involved in following SAQA's suggested visioning format. The fact is, I'm not much of a group person, I prefer working on my own, don't need frequent support or handholding, and usually end up resenting the amount of time involved in group participation. This year, I'm not even a SAQA member any longer (couldn't afford to renew a couple months ago), and I care less and less about following anything suggested or prescribed. The only thing that's ever worked for me, in the long run, has been to follow my own muse wherever she may take me. I'm finally okay with that. I don't need anybody's agreement or critique of what I do. So anyhow, back to next year, I don't have any grandiose plans. I'm just going to keep taking it one day at a time. I know that as I continue to clear away old stuff from my life, doors will open with new ideas and new directions, and my next creative steps, whatever they may be, will happen organically. 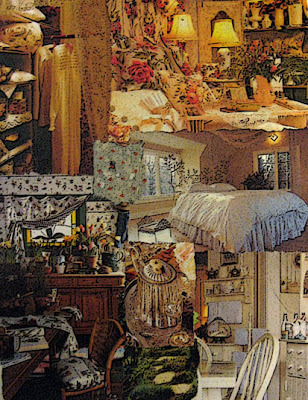 I seriously considered getting on the calendar bandwagon this holiday season, with images of the daily collages I produce and post to Collage Journey. The problem I encountered is that neither Lulu nor Blurb have calendars that open in the vertical format. Duh, why the heck not? I'm not keen on calendar pages with vertical images surrounded by large blank areas. I have been making some collages recently in horizontal format, but frankly I don't like them as much as my vertical pieces. Maybe this will work next year -- I did make a suggestion to the powers that be at Lulu that perhaps I'm not the only artist who would prefer vertical orientation for their images. I've also thought about self-publishing a book of collage images but there were too many decisions. Instead, what I've done is create Archive Pages on Collage Journey, where I have between 80 and 100 images at a time, beginning at the beginning. Since Picasa Web Albums (part of the evergrowing Google conglomerate) already contains everything I've ever posted to all of my blogs, this was a fairly easy thing to do. Archive 1 is here; Archive 2 is here. I'll get around to the next couple of Archives later this week. Here's number seven in the In Dreams series, finished over the weekend. 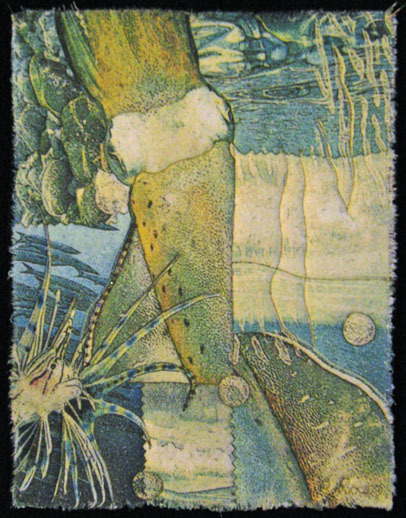 I just listed number four for sale at Etsy. Number five is also ready to post later this week, likely on my sales blog. I spent much of the holiday weekend getting ready for a big Liquidation Sale I'm having this coming Saturday, December 4, at Sproule Studios, 358 Main Street in Fortuna. I'm selling off all my coned weaving yarns, handspun knitting and weaving yarns, oodles of knitting, beading and weaving magazines, some handwoven items I'm ready to let go of, ditto a beautiful handspun handknit winter tunic, spinning fiber, jewelry I made when I was making beaded jewelry, small bags of beads, and small art quilts. If you're in the Humboldt area or plan to be on Saturday, stop by and pick up some wonderful things! And don't forget: I'm having a Holiday 25% Off Sale on everything listed in the Art For Sale Gallery on my website -- that's 25% off the listed prices. The sale is happening right now through Friday, December 10. To order, go to the gallery, and click on any image to get more information on that piece. Right under each image is a link to Inquire About This Work -- use that form to email me that you'd like to purchase, and I'll send you a PayPal invoice. It's that simple. Shipping and sales tax (CA only) will be added to the invoice. All orders will be shipped in time for delivery before Christmas. I'm having a Holiday 25% Off Sale on everything listed in the Art For Sale Gallery on my website -- that's 25% off the listed prices. The sale is happening right now through Friday, December 10. 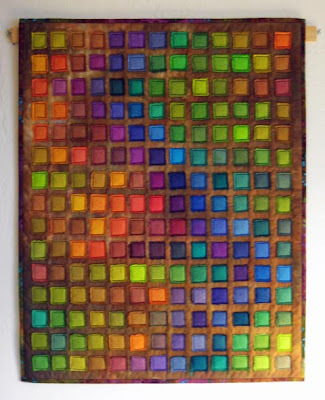 I have 27 quilts listed for sale in the gallery, and four art cloth wall/space hangings. The listed prices for everything have already been reduced -- in some cases by 50% off the original price -- and now is your opportunity to save an additional 25%. Thanks so much for your support and interest in my work. Have a wonderful weekend! A few months ago I made three quilts that really stood out from the rest of my work to date...and this is a fourth in that series that never quite became a series -- but could, still. You can see those pieces here, here and here. Towards the end of those three pieces (the first of which, Going in Circles sold recently), I began piece number four -- that would be what you see in the photo, MINUS the orange/black discharged foundation fabric. 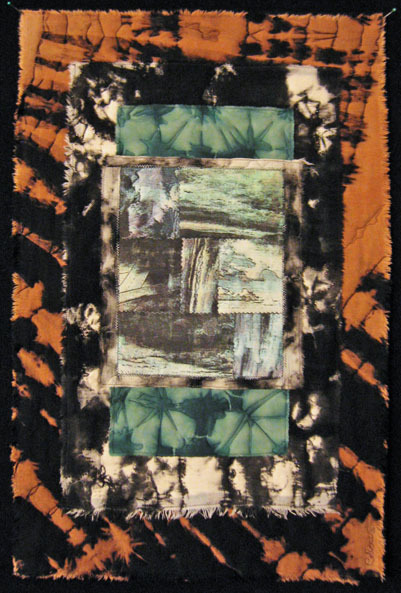 I nearly forgot about the black/white/turquoise piece, then found it and hung it in front of the orange/black fabric just to get it out of the way, and then realized it all looked too good together to not work into one quilt. So that's what I'm doing. 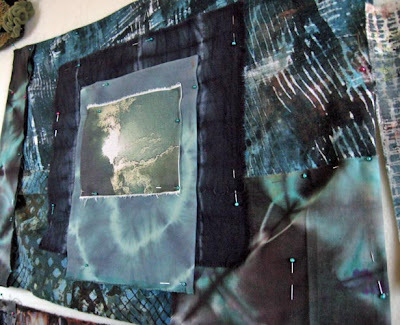 The digital image in the center is one of my collages transferred onto fabric. I printed the image on a transparency, then burnished onto fabric treated with acrylic medium. It's too stiff for my liking but it will work well here. I spent the weekend framing small quilts so I'll be posting new work for sale at Etsy and on my Sales Blog in the coming days. 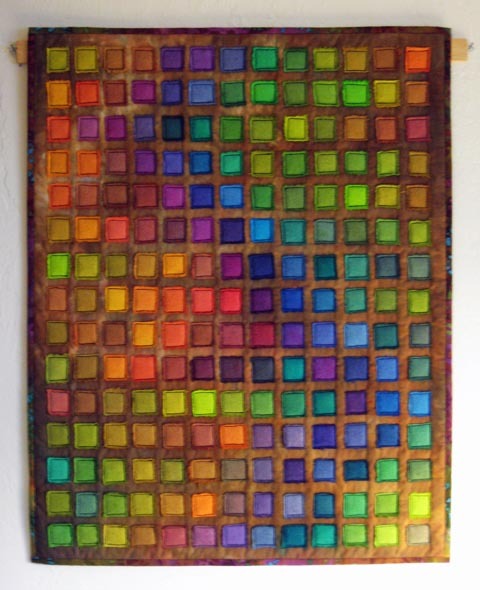 Most of the 10x10" now-framed quilts, from my 2009 weekly quilt series, were never available for sale before. I don't have room to keep all those "keepers" any longer! So keep your eyes on those venues for wonderful holiday gifts! 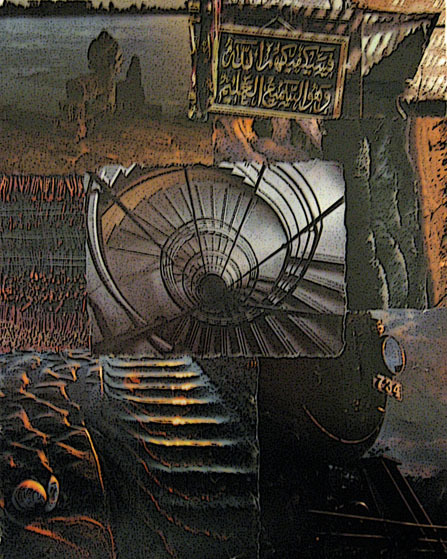 Number six of the In Dreams series. This image was always one of my favorite collages. I like it even better quilted. I received great news the other day -- one of the two pieces I had in simply irRESISTible, the resist-themed show at Some Things Looming Gallery in Reading, PA, SOLD! 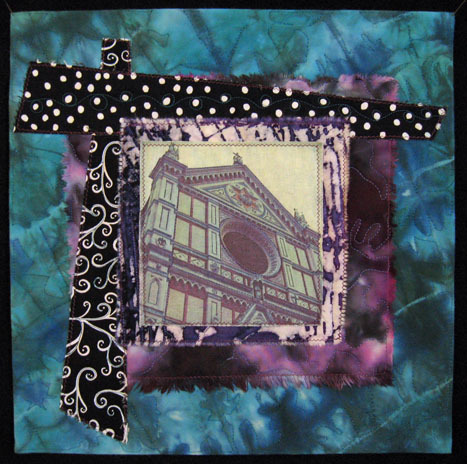 This is very exciting for me, it confirms that my vision for art quilting is marketable. I'll be doing a lot of framing this weekend, now that I have what I need. 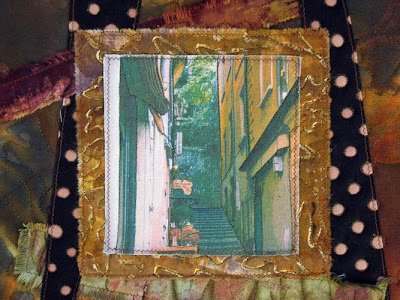 Want to get In Dreams mounted on frames, as well as frame up the last batch of 2009 10x10" quilts that were among the very best. This is the fifth piece in my In Dreams series, completed on Monday. I printed several more images on fabric yesterday -- I can see this being a big series because I'm loving these pieces. As soon as I can get the frames painted, I'll start listing them for sale elsewhere. 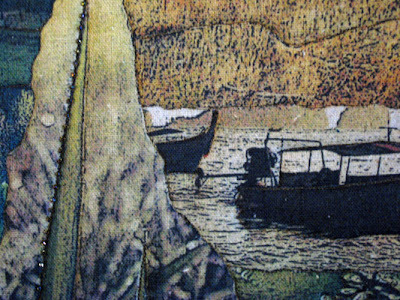 Since my article on Abstract Digital Imagery was printed in Quilting Arts, I discovered an even better way to deal with digital printing on raw silk. Cut the fabric to size, as usual, treat with Bubble Jet Set and dry. Then iron it to a letter sized piece of card stock that's been treated with spray adhesive. Works much better than double sheets of freezer paper, as I had recommended in the article. You can use the same piece of card stock innumerable times, and one coat of spray adhesive will last for several fabric prints. 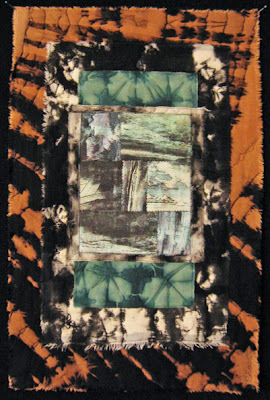 This is my Fiberactions "transformation" quilt, entitled Reconstruction. I started with the background fabric -- one of my best loved early handprinted fabrics in cotton/linen -- then manipulated digital images of the fabric and printed one on homespun cotton, the other on raw silk. The quilt says a lot to me about taking things apart and putting them back together newly, which is pretty much what I've done with my entire life, recently. The piece has a refreshing quality to me, complex in pattern but simple in design. I finished number four of the In Dreams series late last week -- this is it. Number five is just waiting for beaded embellishment. 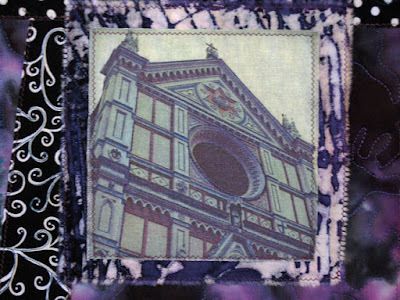 I've been reading Marlena de Blasi's A Thousand Days in Venice, which chronologically comes before A Thousand Days in Tuscany, which I read a couple months ago. I really love her writing and I plan to read all her books. Not only does she rhapsodize Italy in all its splendors, but she's a terrific writer who has a gift for saying things lushly and beautifully. Tomorrow is reveal day for the Fiberactions "transformation" quilt -- so plan to stop by and check them out. 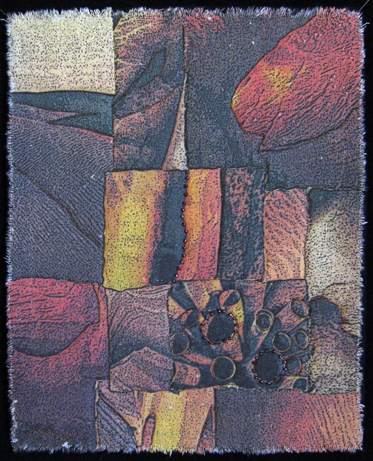 I'll be holding an online 25% off sale of all work in my website Art For Sale gallery. Stop by now to see what I've got listed -- then come back between November 26 and December 10 for the sale. Everything listed there -- studio quilts and art cloth -- has already been reduced in price...and I'll be offering 25% off the listed prices during the sale. I'll say more about this as the time draws near. After moping about for a few days, I caught a wind of inspiration the other evening, and got back into my In Dreams series. This here is #3. As soon as I get one of them mounted on their black canvas backgrounds, I'll post that. Meanwhile, I've been experimenting with blacks, for the stretched canvas...meaning I've given plain black gesso a go and decided to put a coat of black matte paint on top of that. Just need to get the new black acrylic paint. Another issue that's been holding me back from moving forward, is that since I've been framing most of my quilts lately, the fact is I've run out of wall space to hang them and don't have much storage space in Rose Cottage. So I decided I've got to get selling them to make room for more. 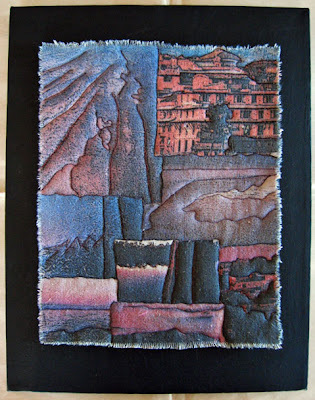 Over the weekend I'll be posting new work for sale at my Sales Blog, and probably Etsy as well. I'll say more about this later. Another quilt series in my imagination at this point will be wholecloth pieces of cool fabric I've designed -- different sizes and shapes, depending on the fabric itself. I had a first piece for this series in mind, the fabric on a hanger in my studio, and I pulled out something else I began work on months ago and hung it in front of the other fabric just to get it out of the way. Viola! Unexpectedly, the two fabrics together will now make one quilt -- I love when that happens! I've been so busy with this and that -- sorting and sifting, tossing, selling, paring down, organizing, reconfiguring -- that I've done virtually no art in the last week. 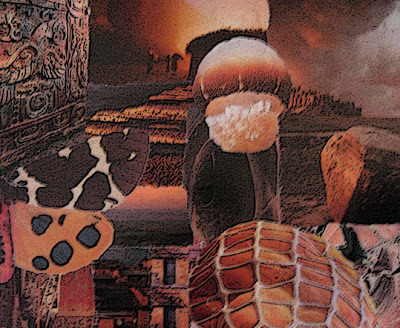 A few collages, but nothing else. Nor do I have much to show for the last month. This is rather perpetually how my life has been -- both my personal life and my art life. I'll get just so far along in one medium or another, one home or another, one job or scenario or another, and then the universe shuffles the cards and things look altogether different when the dust settles. 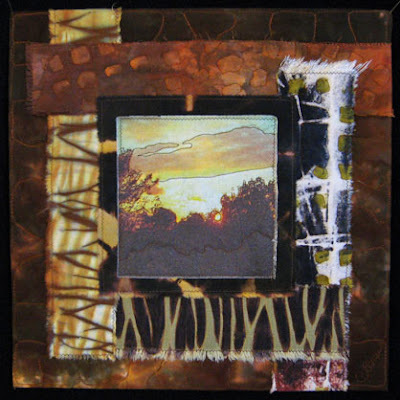 I'm hoping the time will come, soon, when I'll feel re-inspired to get back into surface design and quilting. The farther away I get, though, the harder it is to get my head around coming back. It's been really challenging for me to feel a sense of growth and development in a particular medium over time, because things have changed so frequently for me. I'm not complaining, though...I feel grateful that I've been able to cover as much ground as I have in so many textile media throughout the years. I just don't feel as though I've gotten really good at any one thing, and there is some regret in that. Well, that's not totally true -- I got really good at spinning, but then my hands gave out. But overall, I guess I'm more of a Jill of all trades than a true master at anything. But maybe the issue in artmaking isn't about becoming a master at all. Perhaps it's about trying a lot of things, experimenting with a lot of different media to find out what one likes best, then combining all those acquired skills and familiarity with materials into something new and different. In other words, finding one's creative voice. In which case, I suspect I'm probably right where I should be in my own journey as an artist. 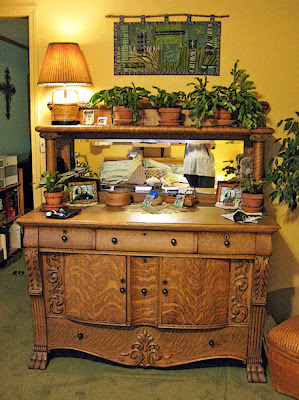 I said goodbye today to Isabel, the lovely oak sideboard I'd had since the mid-1990s. 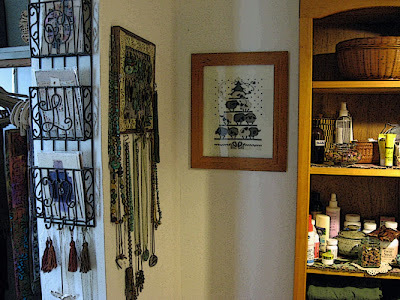 This photo was taken about a year ago, shortly after I completed Lakeview, the quilt hanging above her. Although I am not sad to part with Isabel, because I was ready to let her go and move on, she did represent a number of things to me during her tenure in my life. Having her as the centerpiece in my home for over 15 years made me feel as though I had had a loving family, that she was a family heirloom that had been bestowed upon me, as though I had a viable thread to the past. Isabel also gave me the feeling of being settled, of being a family unto myself, the sense of having a place that I could always come back to. Of course, all of that stuff was just the story I told myself for as long as my lifestyle could support having a huge piece of furniture and the space to accommodate her. It was just that though, a story, and Isabel was just a beautiful piece of furniture. As of this evening she is being installed in her new home, back down to southern Humboldt with friends I haven't seen in maybe eight years. They are a family, there are young adults in the mix who will undoubtedly end up with Isabel, as she is passed down in the future to another generation of people who will love and appreciate her. And now I am completely moved out of my recent former home...and almost completely out of the storage locker where I was housing a variety of things...and I've sold, dumped, or freecycled nearly everything superfluous to my life, now. I can't tell you how good it feels. 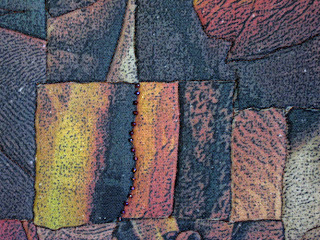 Again, no fiber images to share -- although I finished two quilt projects over the weekend that I can't show yet. 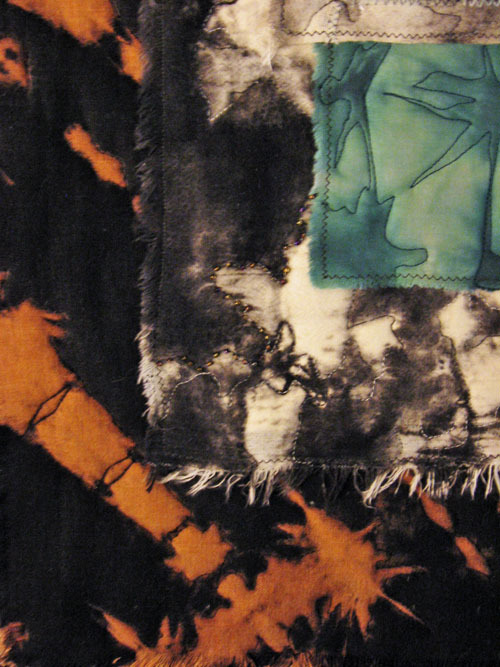 One is the Fiberactions "transformation" quilt, which will be revealed on November 15. 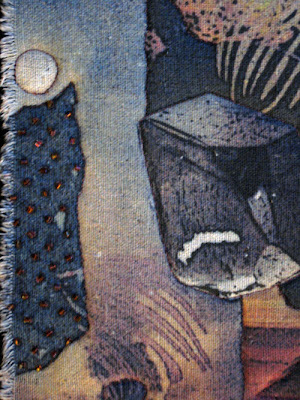 The other is a commissioned quilted pet portrait that's a surprise for the recipient, so I don't feel good about showing that either. I sold my spinning wheel/spinning chair and lots of accessories late last week. Today I started to inventory the spinning fiber and yarn I have for sale -- boxes and boxes of it! I just listed a couple things at Etsy -- silk hankies for dyeing and spinning, and luxury fiber sample packs. I'm planning a local sale on Saturday, December 4 here in Fortuna. More on that later. I'll be posting more stuff to Etsy throughout November. So check back regularly. We've got Indian Summer happening here now -- it was HOT (for us) today, in the 70s. I've got the windows open, fans on in both rooms, and still I'm sweltering. I wasn't meant for hot weather! In more downsizing news, I decided to sell my weaving loom and my spinning wheel. Those of you who've been with me since I began blogging, not quite three years ago, may remember that virtually all my early posts were about spinning and/or weaving. So this is a BIG change. My wheel and my loom, and all their accessories, along with boxes and boxes of spinning fiber and handspun and commercial yarn, have been in storage since early last year. As I look down the road, I simply can't envision a time or place where I'll spin or weave again. So it's time to clear it all out and make room for the new. I'm selling each piece as a package unto itself. The loom package includes the Schacht Mighty Wolf 8-harness, 10-treadle, 36" wide loom, warping board, adjustable bench with pockets, double the number of heddles, 4 reeds, shuttles, bobbins, a bobbin winder and more. The wheel package includes the Lendrum double treadle spinning wheel, Ashford spinning chair, tension lazy kate, niddy noddy, umbrella swift, hand cards and more. If you'd like detailed info on the loom or the wheel or both, please email me and I'll send you PDF flyers with photos. I'm planning to hold a sale of the spinning fiber and yarns in the near future, for the local fiber community. Whatever is left I'll likely sell at Etsy or on my sales blog. 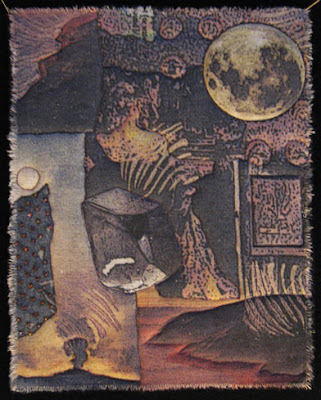 I'm thinking of calling this series In Dreams -- the collages, quilted, are ethereal, like dreamscapes, images morphing into one another. This is the second piece. I've got several more in process now, or at least printed on fabric and waiting their turn for completion. Where did the last week go?! I can't remember the last time it was a week between posts for me. Probably it's better to not say anything if I don't have something to say! 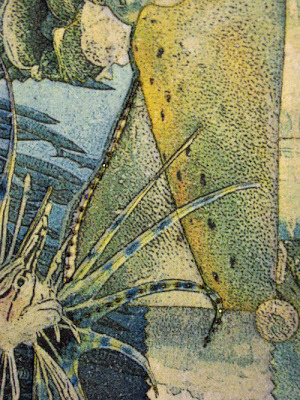 I'm still here, though, plugging away...more like trudging away, taking care of various life organization errands with spurts of artmaking thrown in here and there. I'd planned to quilt all day today on my Fiberactions transformation piece, then things got in the way. 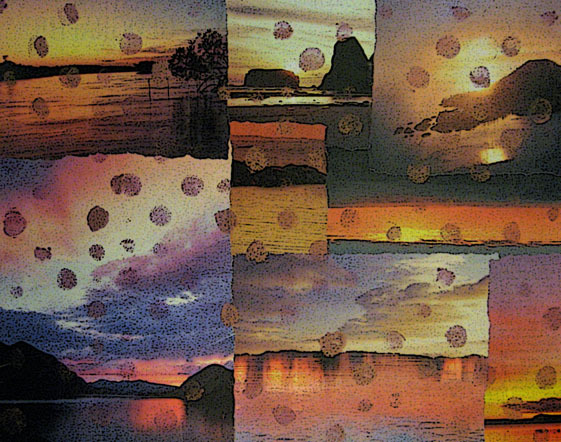 I did add beads to the first two dreamscapes this morning, as well as print more digital images on fabric for the series. That's something! I've been reading Await Your Reply by Dan Chaon the last few days, and really enjoying it. In these days when I've been reinventing myself yet again, this novel has been a coincidental treat. I've got no textile-related images to post at the moment, although things have been moving slowly forward. I've been feeling alternately overwhelmed and unmotivated recently. For one thing, I've had this strange not-really-a-head-cold thing happening since late last week, that's slowed me down. I think the recent round of big change in my life has caught up with me. Another move, another consolidation, another go through everything I own to pare my life down to a sustainable level. Oh well, on with it. 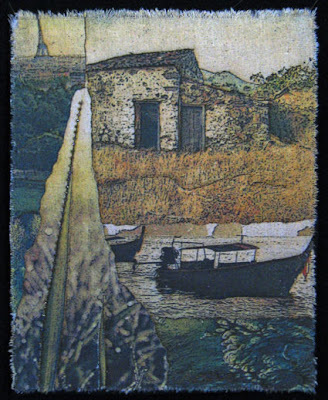 I did a second piece in the new series (see the last post), this one printed on raw silk, and I liked it even better than the first. Have decided to do the entire series in digitally-printed raw silk. And I'm also going to embellish each of the quilts, most likely with judicious beading. Fiberactions' next challenge word is Transformation, to be revealed on November 15. I have the quilt designed, just need to put it all together. 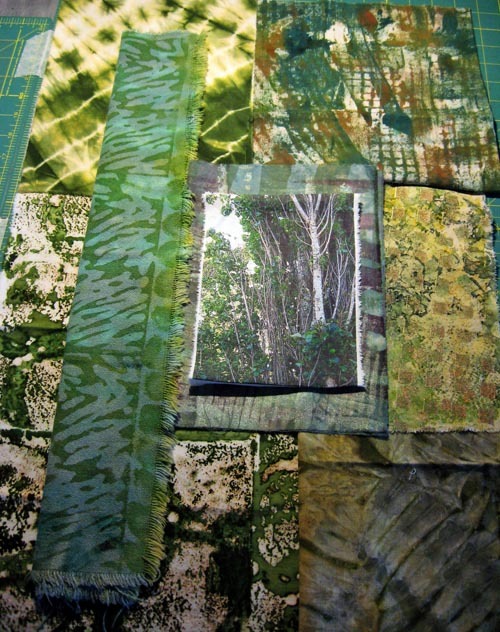 My local art quilt group is doing a challenge exploring the design element line, and I have fabric ready to go for that, as well. 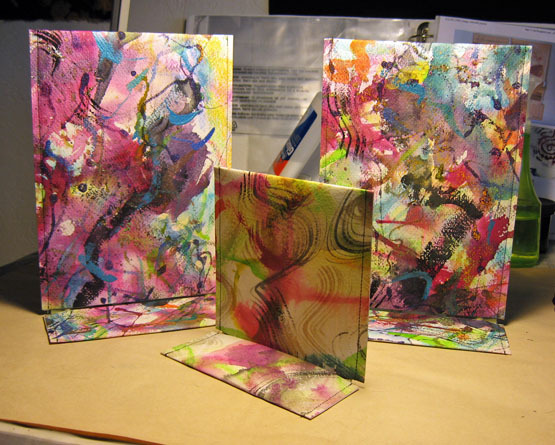 And the 4-piece series on Fortuna skies and trees is also in process. Everything's going slowly now, though. I've been lamenting that it's been too long since I've done any surface design -- and there's so much I want to do. It's a little bit less convenient now, being that I'm living in my studio, much of my materials and tools are stored in my Annex, a shed outside a few steps from the front door. And I can't leave fabric on plastic to batch overnight all over the floor now. 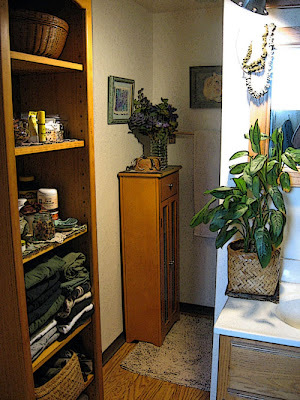 Actually, these little challenges may be a blessing in disguise -- perhaps now instead of trying to do everything, I'll only do those techniques that I can reasonably do given the limitations of my space. And speaking of space, if any of you have ever wondered why I work on the small side, and increasingly so, it's simply because I don't have the space to make big work (surface designed or quilted), nor do I have the space to store it. Nor do I have the money for all the materials required for larger pieces. 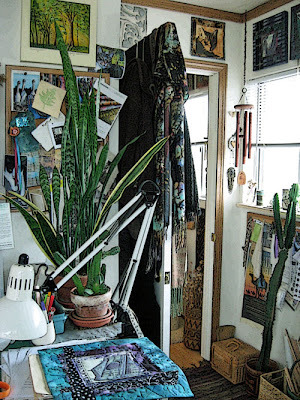 Art/life/living on a budget, space- and money-wise -- subsistence artmaking! Anyhow, I'm slowly getting myself together for the day. Hope you have a lovely week! This piece is the first in a new series I'm working on. 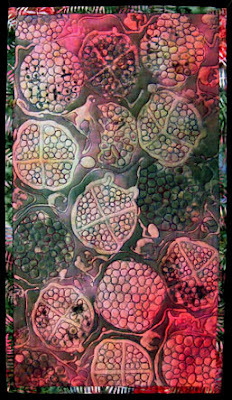 Rather than being a collage quilt, this is a quilted collage -- one of my daily collages, manipulated in Photoshop, printed on fabric, then quilted. 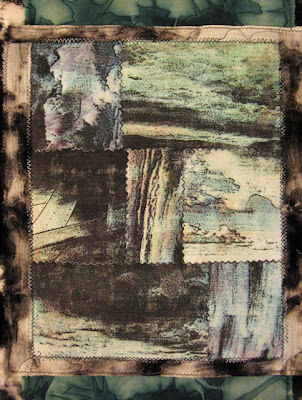 Quilt size is 8.5x11" mounted on a black-gessoed 11x14" stretched canvas. Let me know what you think. It's a gorgeous autumn morning on the North Coast, what I call a sterling day -- sunshine and no clouds, crisp breeze, and everything feels right with the world. Hope you have a good one! Three months ago I posted photos of piles of fabric being auditioned for four upcoming quilts (that post here). This weekend I started fooling around with these. Here are a couple of first takes. I have myself a one-piece gallery on the wall in the front room of Rose Cottage. I just hung a new show today. 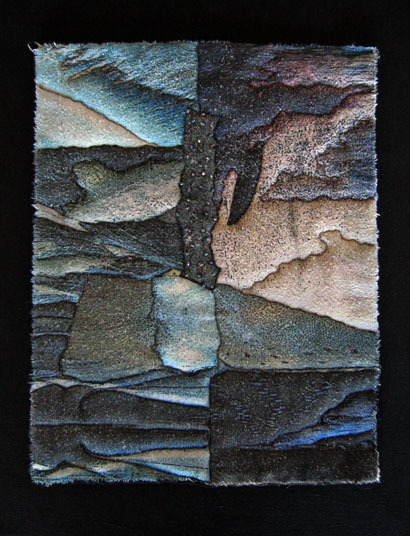 East/West of Purple, from a few months back, is made of procion-dyed raw silk samples on hand dyed foundation cloth. 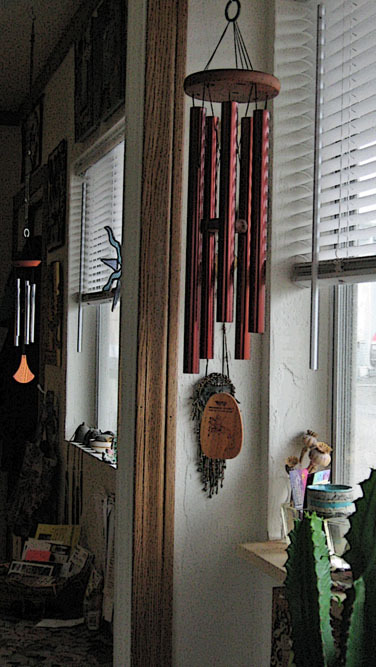 I decided to use the same hanging slat for whatever I show, so I don't have to put holes all over the wall for different width pieces. I've had a really lovely day at home all day. I feel so content, I have everything I need for life/art virtually right at hand. ...for now, perhaps. 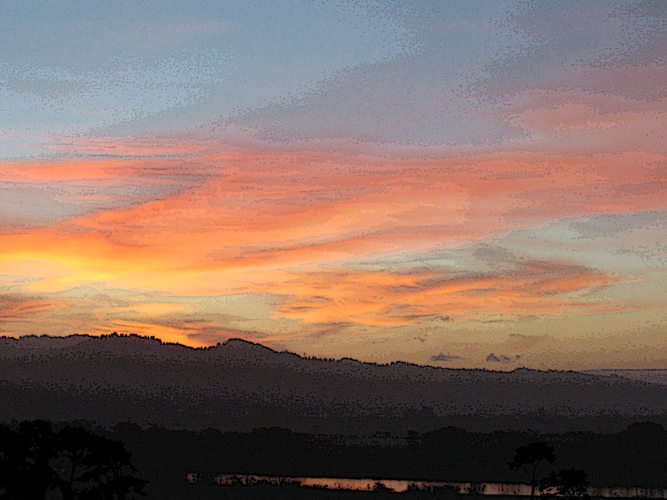 This is Tuscan Sunset, number 18 in my Italy series. I'm stopping here for the time being, but I will likely sell a few pieces before my upcoming show next spring. In which case I might make another few. And now it's on to other projects, most of which are still in the rumination stage in my mind. I am missing quilting, though, so I may do a few small pieces simply for the pleasure of the quilting itself. We have a chance of rain throughout the weekend, and that would be okay with me. 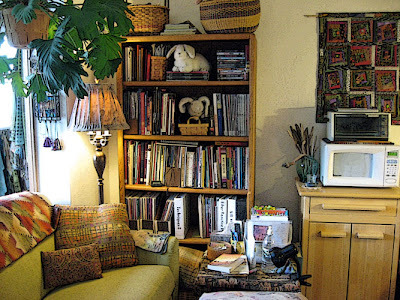 I've gotten into a nice routine here at Rose Cottage -- I can easily spend the entire day here without leaving to go anywhere, and still feel connected to the rest of the world if I choose. Lovely! The next to the last in the series -- Star of David. This is the Great Synagogue in Florence, IT, a gorgeous, blue-domed house of worship for Florence's Jewish community of 2000 people. Unfortunately I never saw the inside. I'll make a point of doing so on my next trip to Italy! I actually took a day off yesterday -- my first complete day with no art and no work in over a year. I'd gone to sleep early on Sunday evening, slept nearly 12 hours...watched Castle episodes online for a while late morning, then read and dozed all afternoon. And got another 8+ hours sleep last night. Today I feel great. I think all the recent changes just caught up with me. But maybe I'll let myself do this more often! I'm slowly getting into Tuesday. It's a beautiful day out and I plan to enjoy it, whatever I do! Enjoy these views of the interior of Rose Cottage! 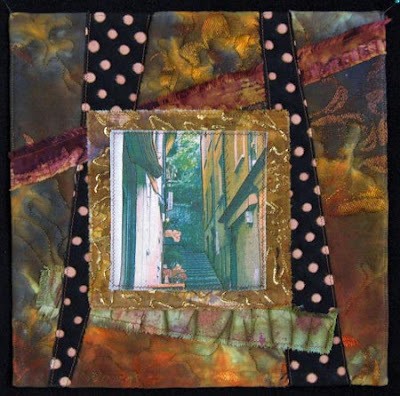 Another Italy quilt -- Varenna Stairway, 12x12" mounted on stretched canvas. Varenna is the town I stayed in on Lake Como. Built right on the edge of the lake, as virtually all the towns are in the lake district, there are numerous stairways connecting different levels of town. If one were driving, the road would S-curve its way up the hill. We've got a foggy, damp morning in Fortuna. I wish I would just rain, I'm in the mood for it. Nevertheless, I've got lots on my agenda for the weekend. Last night I reformatted the galleries on my website. Have a look if you'd like. 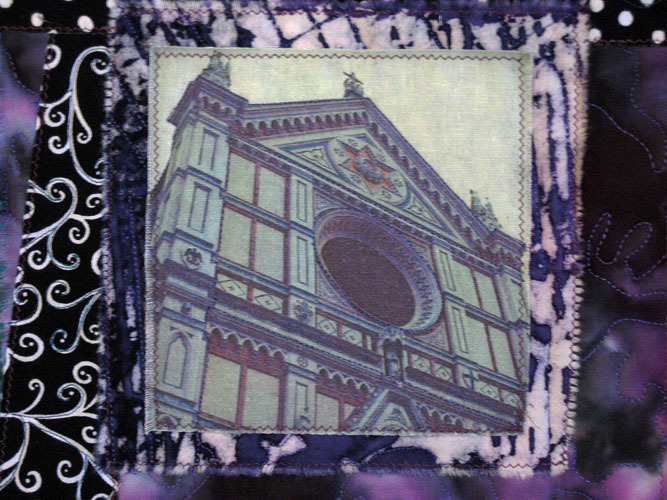 I'll finish the last two Italy quilts (did one yesterday, actually), and do more work on the next series or two. I've also got to rebuild my paper filing system and do a few other marketing tasks. I added another piece to the sales blog last night, as well. Hope you have a great autumn weekend!